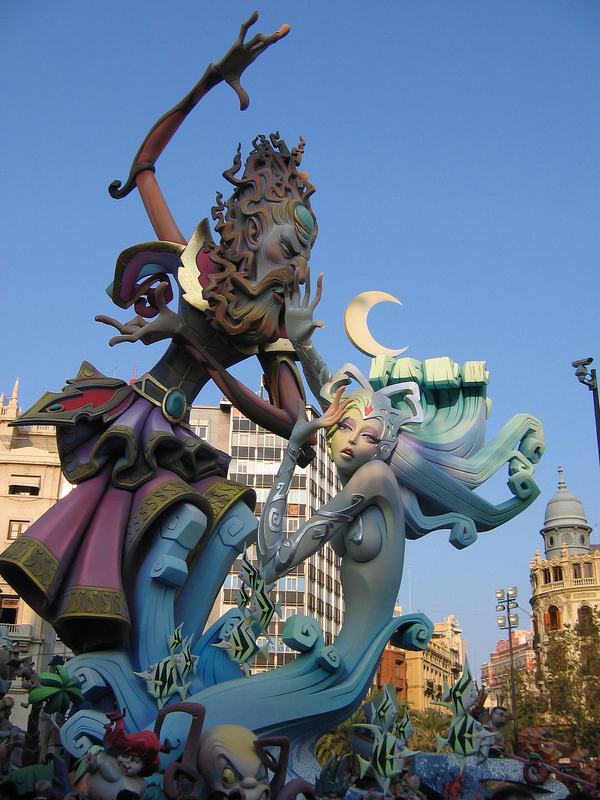 Valencia bakes in the sun by day, smells of oranges at night and burns entirely once a year, during the world-renowned Las Fallas Festival, the city’s most important holiday—when the noise of fireworks and the stink of gunpowder fill the air for several sleepless nights in March. Valencia, the third biggest city of Spain, is sometimes perceived as the “ugly sister” of Madrid and Barcelona. A grossly inaccurate comparison, but one at least that has helped it stave off the invading crowds who prefer to visit her aforementioned siblings. In fact Valencia is undeniably picturesque, the wriggling streets of its Old Town betraying both Roman and Arabian influences and punctuated with meticulously maintained orange gardens and open squares full of outdoor cafes that bustle until 3am. Girding the Old Town is the dried bed of the river Turia, a beautiful green belt of attractions including the amazing Bioparc immersion zoo and The City of Arts & Sciences. The latter is one of Valencia’s most recognizable symbols, a futuristic white city designed by avant garde local architect, Santiago Calatrava. If that wasn’t enough, the city’s never-failing weather (with an average of 15 degrees Celsius on Christmas Day!) 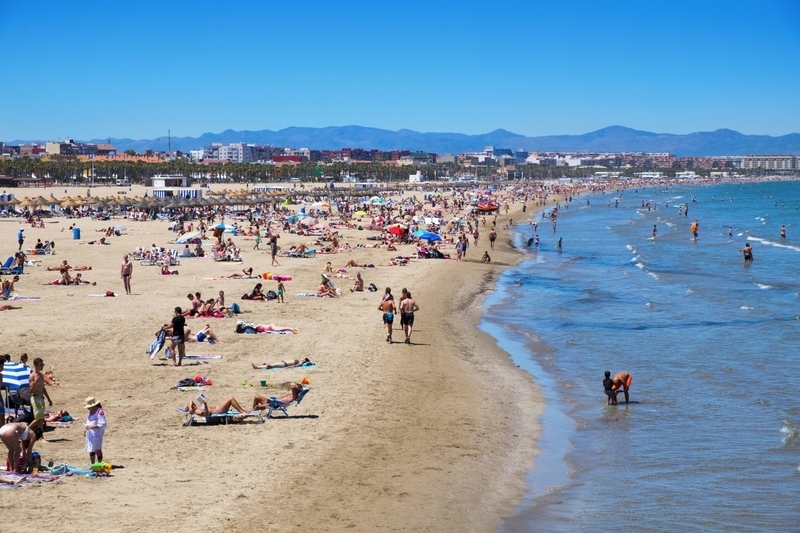 and long stretch of Mediterranean beaches make Valencia even easier to fall in love with. Valencia’s heart remains in its medieval Old Town, and the best spot to start any walk is at its central point, the huge gothic Cathedral of Our Lady (you can find it located between two cozy, medieval squares: La Plaza de la Reina and La Plaza de la Virgen). Remarkably the Cathedral holds the very chalice that many historians believe to be the true Holy Grail (someone really should have told Indiana Jones), and after you’ve paid your homage you can enjoy some of the best views in the city by climbing the Cathedral’s highest tower, El Micalet. Casting an eye over the medieval architecture of the Old Town it doesn’t take much imagination to picture the city’s greatest hero, the Moor-fighting knight El Cid Campeador, being hoisted triumphantly through the city streets. From La Plaza de la Virgen it’s good to take a slow stroll down Knights’ Street (Calle de los Caballeros). Here’s where the famous El Carmen quarter starts. Strolling down the narrow streets, crossing La Plaza del Negrito and heading South, you will reach the stone building of La Lonja de Seda: the old silk market and one of the greatest examples of lay architecture from medieval Europe. In front of La Lonja you can see the huge art nouveau Mercado Central building, one of the largest indoor markets in Spain. Fresh seafood is delivered here every single day, although nota bene: the city’s specialty, paella valenciana, doesn’t in fact contain any seafood whatsoever—originating from the nearby marshes true paella consists of rice, saffron, garlic, chicken and rabbit. Entire rabbits with no skin and plucked roosters’ heads make some of the market’s stands look quite spooky. 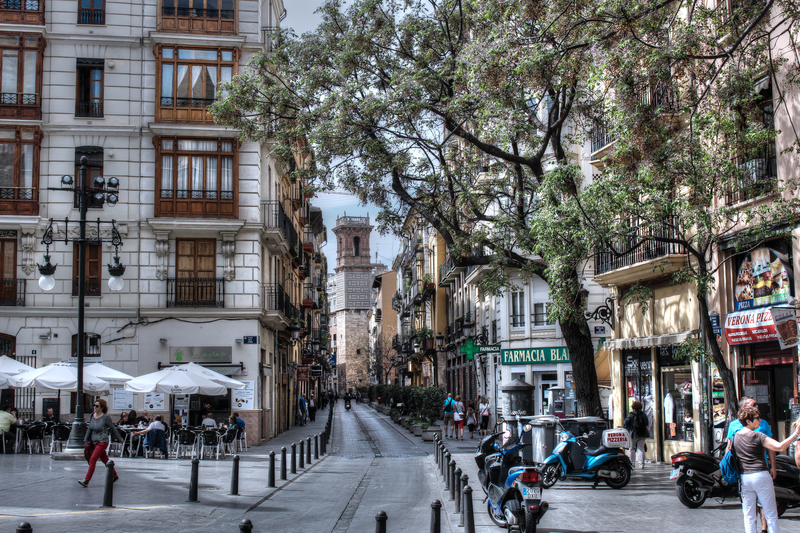 Surprisingly, El Carmen, Valencia’s most famous district, has managed to retain its authentic feel, despite its location in the center of the Old Town and being a firm favorite on the tourist track. The district is renowned for its quirky look and late opening hours of its tiny bars, whilst the liberal vibe has also made it a Mecca for hippies. 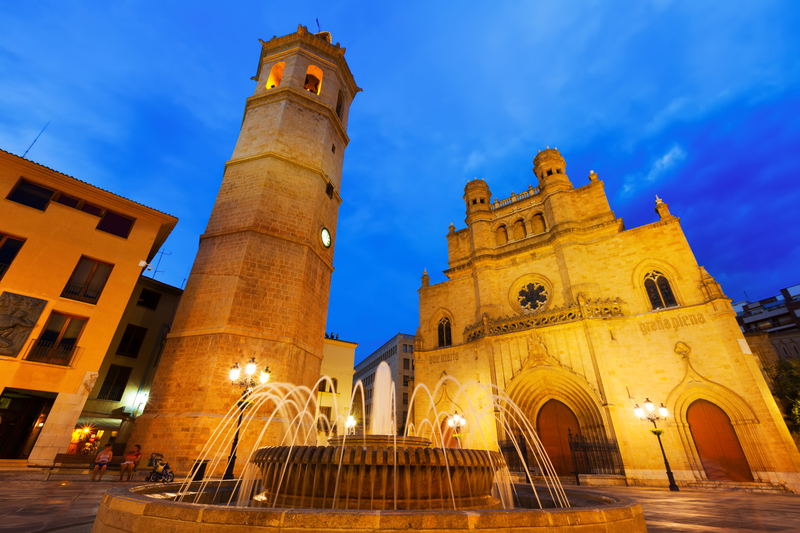 Two of the best spots to start a Valencian night out are on La Plaza del Negrito and Baja Street. However, if you really want to escape fellow foreigners head to the Ruzafa district instead. Here, inconspicuous bars, scenic squares and gardens exude a chilled-out atmosphere and you can often find live music by street musicians. One recommended place is Cafe Ubik, a small bookshop-cafe where you can pop in to have breakfast or start to your day with a glass of red wine (yup, Spaniards do it! ), meet up with friends or just swap some second-hand books. It would be a sin not to take advantage of the amazing weather conditions that the city has to offer. No wonder that most of the Valencian’s favorite activities take place outdoors. A bike ride along the dried out river Turia is a perfect way to see the best of the green side of the city. Colorful cascades of flowers, exotic trees and fountains line the route eastwards to the final destination of Santiago Calatrava’s La Ciudad de las Artes y Las Ciencias. 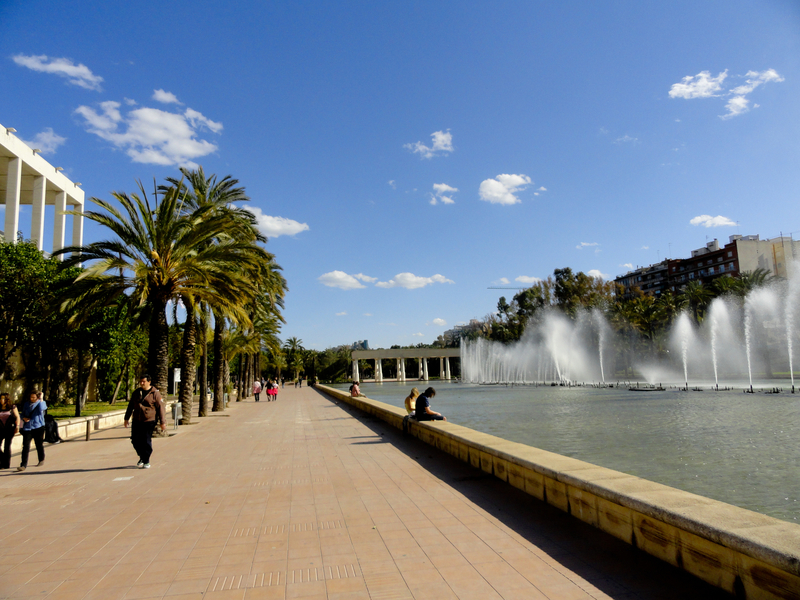 At the far west end of the old Turia River’s bed, el Parque de la Cabecera is located. Never mind the distance, because once you’re there, you will feel as if you were five again by taking a ride across the lake in a kitsch swan-shaped gondola. More festival madness takes place on the last Wednesday of August every year, just outside Valencia, in the village of Bunol, in the form of the world’s most famous food fight—La Tomatina. Armageddon with tomatoes. Finally Valencia is home to one of Spain’s finest football teams, winning La Liga six times in their history, including twice in the 2000s—not easy when you have to beat Barca and Real Madrid over the course of the season! Sports fans will enjoy the experience of seeing Los Che in action. Home Backpackers is located in the very center of El Carmen district and, with its big kitchen and common room, is the perfect spot to make new friends and meet fellow backpackers. The only annoying thing is the lack of elevator (the building is 4-floor high), but in the end who cares when a huge sunny terrace greets you at the top of the roof? If you’re looking for a more intimate atmosphere you can go for Home Youth Hostel or Rooms Deluxe Hostel, which offer nicely-designed customized private apartments and small shared rooms, instead of bunk beds and crowded dormitories. For the most demanding and sophisticated visitors, there’s nothing like the luxurious, Las Arenas Hotel, located at Malvarrosa beach. The hotel has become famous for its impressive gardens, terraces and almost one-century-old spa and swimming pool complex. The Spanish love food and the day’s rhythm is ruled by their eating schedule. A morning coffee with a sweet snack for breakfast, a solid bocadillo (baguette) for lunch, then around 4pm (after their sacred siesta) it’s time for delicious chocolate con churros (hot chocolate with a variety of a doughnut); and then finally a late, long and rather lazy dinner in the evening. Tapas is, of course, the famous food of Spain and the best place in Valencia to try these small plates is La Tapeta del Carmen. The prices are very reasonable, the food is homemade and the number of fully booked tables tells its own story. Wednesday is the discount day at 100 Montaditos, another casual bar (a bit more touristic, though), located at Plaza de la Reina. People start to queue for a table at 4-5pm, as you get montaditos (small sandwiches) with almost any filling you can think of for just one €1. On the other end of the scale Michelin stars have started lighting up the city’s cuisine and the likes of Riff and Vertical will delight gourmets. For something in between a new wave of gastro bars offer innovative tapas dishes in chic venues for very affordable prices. Get in on the trend at Canalla Bistro, where dishes created by famous local chef Ricard Camerena can be enjoyed in an informal environment. 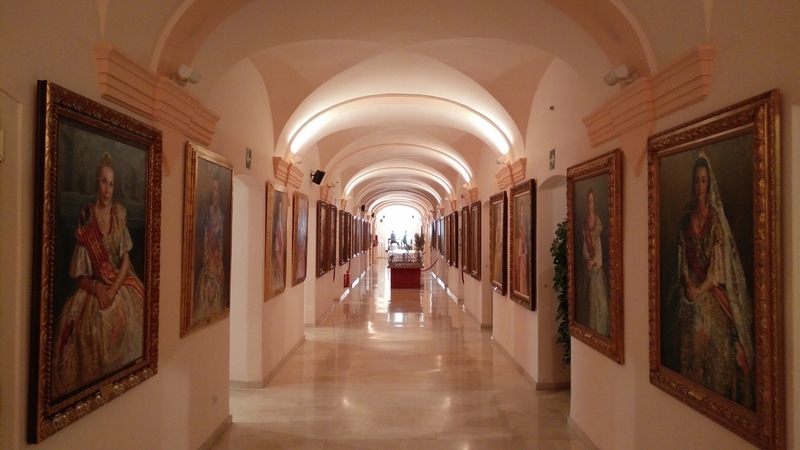 The motto of Valencian people, “vivir sin dormir” leaves you in no doubt of their life outlook. The bars are open all day long and they are followed by the clubs, which open around 2am and don’t close until the break of dawn. The party style has changed over the decades though. In the early 90s, La Ruta de Bacalao (suburban, beach disco houses, offering a great deal of drugs mixed with techno and rave tunes) echoed all around Spain. Those days are gone. Today, in summertime, all the bars along Malvarrosa beach throng with people, often still partying when the first rays of sun creep over the horizon. Las Animas Puerto is the best spot on the strip with great views from its numerous terraces, although sadly the music is a weak point. Outside summer the party is yet more raucous, partly because Valencia is the second biggest city in Europe when it comes to number of foreign exchange students (after Barcelona). The student club zone is Polo y Peyrolon Street and around here even a mid-week night can turn into a never-ending fiesta. For some alternative music seekers, the Piccadilly Downtown club can be recommended. Previously a brothel, today it is a hidden club in the old town with some good indie rock music on the speakers. 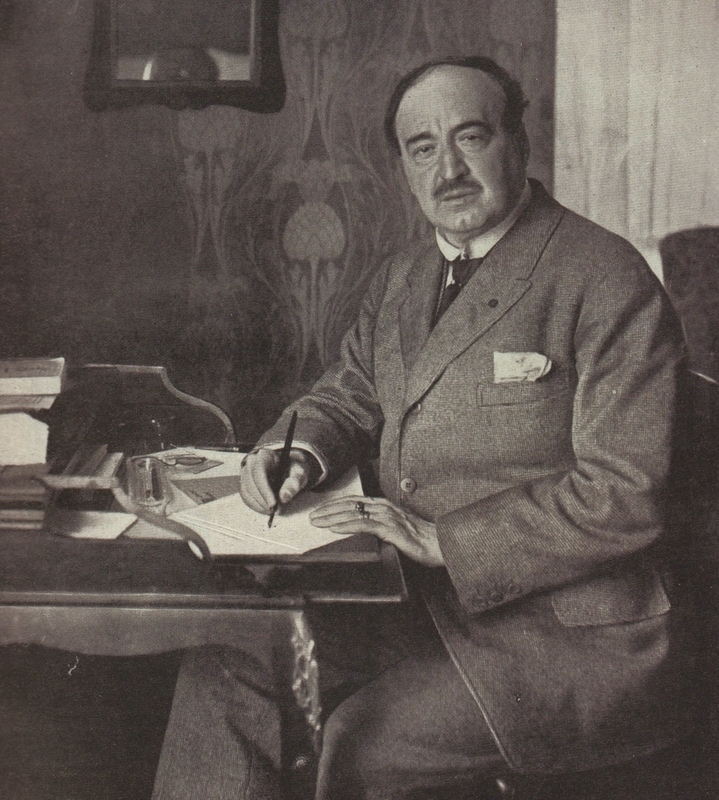 Valencia’s most famous son Vicente Blasco Ibanez is one of the most talented authors ever to put pen to paper, and his WWI epic The Four Horsemen of the Apocalypse is not to be missed, while Blood and Sand is surely the best novel ever written about the art of bullfighting. Finally, the first novel written in Spain was penned and published in Valencia—check out Tirant The White, for the kind of chivalrous romp that Cervantes went on to parody.